The reversible first stage provides a soft damping of slow movements. Elastic systems are used that typically absorb up to 40 kJ of energy on 100 mm of stroke, at 50 % damping rate. The irreversible crash stage forms a controlled emergency stop for exceptional, unintenionally severe movements. Therefore, depending upon the version and design used, it typically offers between 200 kJ and 1 MJ of energy absorption capability. This is in combination with total deformation strokes typically between 300 and 700 mm long that are provided by components around 600 mm (Crash Buffer), or 1100 mm (Duplex deformation system) long. For many of these applications our crash components can be used in their standard version, which are available at low cost and short notice. Beyond that, customer specific adaptions are feasible. Please contact us for assistance in the planning and development of best possible technical and commercial solutions for your application. Below, we show some examples for current and planned alternative applications of EST safety components as universal energy absorbers. 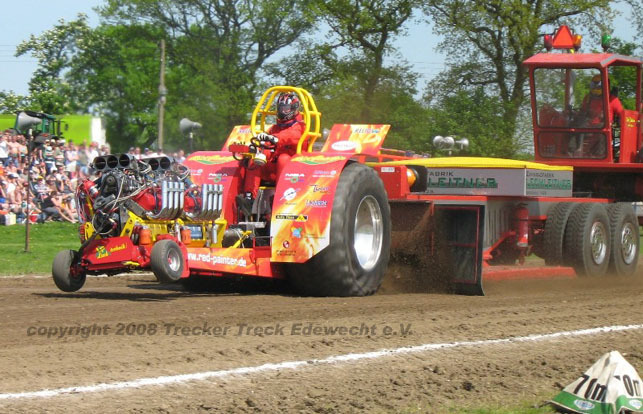 From the 2008 season on, EST Crash Buffers type G1-200 R and G1-200 K have been used on brake trailers for the Tractor Pulling competition. The subsequent photos show the brake trailer of team Trecker Treck Edewecht e.V., as it is used in the German championship of DTTO e.V.. In this application, the EST Crash Buffers serve to catch the brake weight, which is suspended on the trailer free to move, smoothly at the end of each pull with the reversible buffer mode. In an emergency stop, the brake weight is decelerated in a severe, yet always controlled manner in the crash mode regime of the buffers. 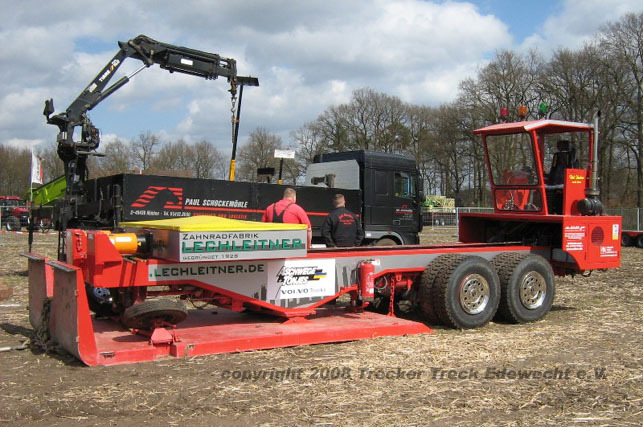 (Photo: Trecker Treck Edewecht e.V., added 30.05.2008). 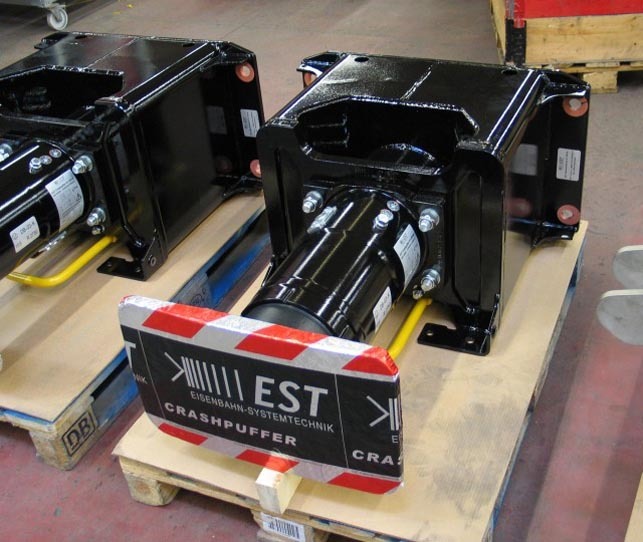 In 2007, an important European manufacturer of industrial production facilities began to integrate EST deformation systems of the special type Duplex G1-200S.A1-200M (consisting of a Crash Buffer G1-200 S and an Absorber Block A1-200 M) in its production machines, in order to provide high performance, multi stage end stops for a moving component of approximately 50 t weight. The first of such production facilities will be delivered to customers in 2008. As ready-to-use energy absorbing components, the EST Crash Buffers and Duplex deformation systems can be used directly as high performance, yet cost efficient and maintenance free rail end stops for railway vehicles, or cranes, or just as well as buffers in shipping piers.